When the pioneer Bohemian immigrants followed the coal mining operations to Coal City, they settled in a concentrated area because of the language barrier. Gordon Avenue was the main Bohemian artery, with a few blocks of intersecting streets taking the overflow. Because of the native custom of raising geese, which these people continued in their new surroundings, the Bohemian sector of the village became affectionately known as "goose alley." These wonderful people were strong on "tradition" and were not about to forget their early training and ideals. They felt a great need for a place to practice these ideals and to strengthen their ethnic ties. A committee was formed, ideas and plans were discussed, and the terrific sacrifice agreed upon. These miners, who were struggling to eke out a living for their families, pledged a weekly payment of land and the construction of a meeting place. The beautiful brick National Bohemian Hall on the corner of Broadway and Church Streets was the result. Great believers in health, discipline and togetherness, the Bohemians put to use the facilities they built. Many of these immigrants were skilled gymnasts and were eager to share this skill with others. Thus, the Bohemian Turners, an extension of the European culture, became a part of Coal City. The Turners had about 150 members, children from twelve years old through adults, who worked out assigned evenings with instructors who were miners by day. Their program consisted of exercises in unions, marching, baton work and Indian Club drills for the beginners. The advanced groups had stunts, tumbling and apparatus which included the side horse, horizontal bars and parallel bars. All of the participants had uniforms and a great sense of pride in their performance. They put on exhibitions and demonstrations which were accompanied by Jack Red's band. Often gymnasts from Chicago would come to view their performance, help them and participate with them. They learned from each other and their dedication was reflected in their years of successful continuance. It was a wonderful "outlet" for these hardworking people who had so little, but gave so much. The Turners was an "all Bohemian" organization. Bohemian was spoken exclusively as they were there to relax and they would have to struggle with the new language. Frank Albrecht was one of the excellent instructors. Frank Vodacek was an outstanding performer of the older group and George Smith sparkled in the younger set. The Bohemian Hall, sometimes referred to as the Opera House, was also the hub of many other activities but "Kajdo nights" were a favorite. What other ethnic group has left such a landmark and a sector of impressions and memories to their chosen community, as did the Bohemians. To these wonderful people it was simply TRADITION. The Bohemian Hall hosted many musical and literary programs. Shown above is a flyer announcing the appearance of Miss Laura Campbell, Pianist, and Miss Rose Trotter, Reader, in the early 1900's. General Admission was 25 cents, as shown on an accompanying ticket. Coal City was home to many fine musical groups, such as Bonino's Orchestra, shown above. Barney Falletti and his orchestra were another well-known musical group. Front row, unknown, Pietro Piagno, Constance Piagno, Berta Piagno. Back row, all unknown. Saloons were a popular meeting place for the miners. Pictured here is Anton Favero (behind the bar) and two patrons. The boys are Tom, Jack and Domenic Favero. The miners would purchase beer in their lunch pails. It is said that they would first coat the inside with butter to keep the beer from foaming, thus increasing the amount a pail would hold. The shorter Italian players became experts in dribblign the ball with some fancy footwork, while the Britisher's excelled in "heading" the ball. This mixture of diverse ethnic talents is what had made the Americans better all-around athletes. During the 1900-1910 decade, the "Coal City Maroons" became famous for their many victories in Illinois. In 1909, they tied the Olympic Soccer champions from England. The British Pilgrims had won their title in 1908 and were challenged by this small Illinois mining community while they were touring the United States. Seven members of the team were of Scotch and Welsh extraction, and the remaining four were Italian-Americans: William Enrietto, Joseph Rolando, Nicola Fornango and Dominick Gomarra. Fornango is also well remembered as the able and long time Chief of the Joliet Police Department. Barney Vidano is still considered by older soccer enthusiasts as the most talented American-born soccer player of Italian descent. Always a leading man, Vidano actively played a major role in the soccer team from 1915 to 1947. Click on any page above to enlarge the booklet to enlarge the by-laws of the Clan Cameron No 47 from Coal City or click here to view the entire booklet. 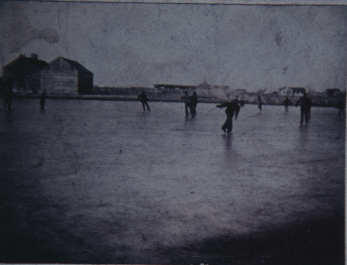 This picture depicts an ice pond in Coal City about 1905. The pond is believed to have been located southwest of the current park. Ice blocks were stored in the building behind the pond. The Coliseum was located at 155 S. Vermilion Street. Built in 1921, this was the first big dance hall in the area. It featured an 8,000 square foot dance floor of highly polished hardwood, and benches for spectators. The Coliseum was very popular until WWII. The building was destroyed by fire.